By digging into your email list and using the information you have available, you can identify the people who are most interested in your business and look for opportunities to strengthen these customer relationships. Here are 7 simple ways you can look to your email list data to tap into your best customers. 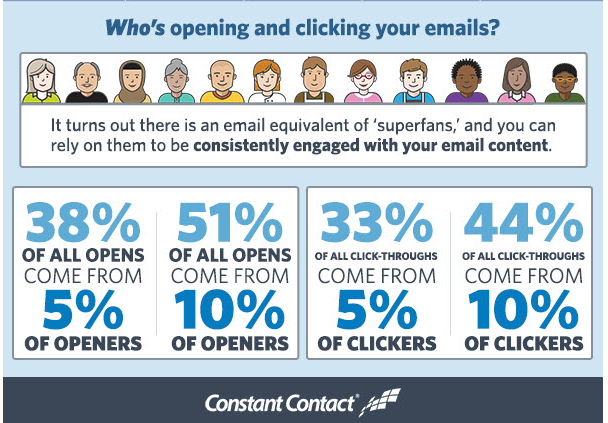 Who opens your emails the most? Data from Constant Contact revealed that 51 percent of all opens come from 10 percent of openers. These are the people who are most interested in what you have to say and have the potential to become loyal advocates for your business. You can find out who these people are in your Constant Contact account by visiting the Reporting area and viewing the contacts that have opened the most campaigns recently. Start with these people. Who are they? What were the topics that got them to open? Consider following up with additional information and look to extend the relationship beyond the inbox. Once you find out which people are opening your emails the most, take a look at which customers are consistently clicking through to the content you put in your emails. This could be a blog post about a new product or service you’re offering or a customer testimonial. There’s a good chance many of these people have already made a purchase or signed up for one of your services, consider reaching out to them with an online survey or a special offer to further that relationship and learn more about what they’re most interested in. Take that step even further by learning how to Create More Targeted Lists Using Click Segmentation from our knowledge base. If you include links to your website or social media accounts in your email campaigns, check out who clicks on these links. These customers are likely interested in learning more about you or connecting with you through multiple channels. It’s always a good idea to include a measurable action for your readers to take. Adding a coupon that people can redeem online is a great way to identify people who are not only clicking through to learn more, but are actually taking the next step to redeem an offer. Look for opportunities to follow up with these people with reminders and other offers to bring them into your store. If you’re using email to promote your social channels, look to see who is taking the next step to like your Facebook Page or follow your updates on sites like Twitter, Instagram, or LinkedIn. This group is a great community to tap to ask for testimonials or quotes to put on your website and to collect photos for use across your marketing. Do you host events for your company? If so, you should be using your email list to promote them. Knowing whether someone has attended a couple of your events can be helpful for knowing that they’re interested in attending future events like store openings or holiday celebrations, bringing friends to your events and introducing you to new customers in-person. And while online referrals are easy and effective, in-person referrals carry even more weight. You may not be able to tell this one from your email list, but it’s another good, online way to figure out which customers care the most about your updates. This group of people (even if it’s a small group) is vocal and clearly willing to share your updates and news, and will not be afraid to give you opinions on your business. Find your brand advocates today. By starting with your email list and doing a little bit of simple analysis, you’ll be on your way to asking these involved, devoted customers to help increase the power of your marketing in no time! When you reach out specifically to your “best” customers, you may uncover some customers that have purchased from you a few times, and are really happy with the experience they’ve had with you. These are the people who will be open and willing to share your message with new customers in their networks and help you grow your business. Have you spent any time looking into your email list to find your best customers? I’d love to hear your best advice. About the author: Ali Hyatt leads marketing and product for Upward Labs, which creates software for businesses to build and manage brand ambassador programs to drive customer engagement and increase revenue and reach.